Their first leather sleeve launched for the iPad before coming to the 12-inch Retina MacBook, and now sliding onto the 13-inch and 15-inch MacBook Pros. Just in time for the brand new Pros Apple also just announced. Available in three different colors -- Saddle Brown, Midnight Blue, and Black -- these genuine leather sleeves carry a high price tag for those looking for cursory protection for their pricey portable Macs. The top of the sleeve -- that is, where the laptop is inserted -- is open a fair amount, making it easy to remove the laptop from its tight fit. Different than on the USB-C MacBook, the one for the Pros does not allow the MacBook to be charged while it is inserted. 200 quid?! That's insane, Apple's gotta be taking the piss. I generally don’t mind paying for quality, but this is plainly silly pricing. It would be quite nice to have an Apple mouse mat made of that material. If you want a leather sleeve for your laptop and you are rich and don’t care what things cost, these are perfect. For the rest of us, a laptop bag at maybe 1/4 this price, with space to store other items is the way to go. $99 for a mouse mat? Here ya go. Noooooooo!!! VEGAN! KEEP IT VEGAN!!! AAAAAAAAAAAAAAHHHHHHH! NOOOO! NO! NO! Whenever some Apple product is reviewed, the caveat is always the high cost. As long as there are consumers willing to pay for Apple kit, Apple will continue to charge high prices. It's that ugly matter of supply and demand. I have often wondered how long Apple can get consumers to pay more, but they manage to do so as new consumers come along. Anyway, that sleeve is nothing I would consider buying so I have nothing much to say about whether it cost too much or not. More power to those consumers who can easily afford whatever Apple sells. I'm truly happy for them and maybe in my next life, I'll have that good fortune. Quality leather is not cheap. I go through motorcycle gear often and there is a difference between cheap leather and expensive leather. I bought the leather iPhone Folio case and for $99, even I thought a bit much. Nonetheless, 3 months later, I love the durability, good looks, and the quality construction. This is some good leather. Sure, there is some margin due to Apple's "luxury" moniker, but either way, I see why they cost $200. If it's too much, oh well. 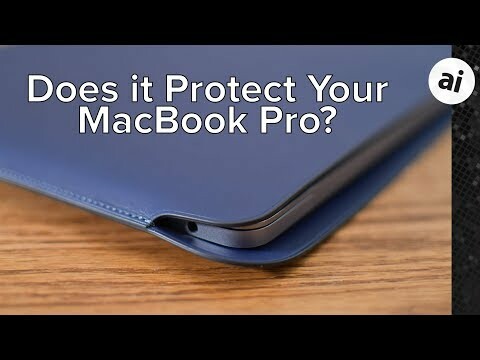 If I had a crappy laptop bag, I'd consider this for my MBP just to give it that better piece of protection. To each their own I suppose. Don’t like the price, don’t buy it. Bitching about it just makes you look petty and stupid like bitching about the price of a Tesla Model S. If you don’t like the idea of Apple being a premium brand with premium prices then switch platforms. Buy a Dell and a cloth laptop bag like @Ireland suggests and brag to all your friends how much money you saved over buying Apple. It’ll make you feel superior to your bourgeoisie friends who bought the MacBook Pro AND the leather sleeve just because they could. Guess what? You can buy a Ford or Chevy with more horsepower and performance than, say, a BMW X5. Guess what? I have a couple of family members who own luxury cars and they need servicing just as much as a Chevy Spark or a Ford Taurus, and the servicing costs a lot more too. So you can get a Dell or Lenovo or ASUS laptop with more memory, faster CPU, ports galore for less money? So what? DO IT THEN instead of bitching about Apple’s prices. Just got one in saddle born for the 15” MBP. it is nice but I prefer the one for the 12” MB, that one flows perfectly over the tapering end and is nice to carry. In comparison, the 15” leaves some empty space between the dull end and the seam. When you carry it, it is a bit awkwardly balancing on the somewhat wobbly seam. I have no problem if Apple charges whatever chooses for status,good to have accessories. You can buy subgrade accessories but when Apple does not upgrade function keys Macbook Pro thinking all Apple fans are rich, afford $2000 !3" Macbook Pro than think twice. Many have to let go Apple product due to affordability which Apple can offer at-least one model. I rather make less but keep the current customer who will stick around for ever. But it's organic leather from grass-fed, pasture-raised cattle! As for the price, clearly you pay more for quality. That's why I buy apple products, and I get that quality leather is expensive, but come on! $180 for two pieces of leather stitched together is exorbitant. All I want to know, is it rich Corinthian leather? Oh, I have no no quarrels with a company’s margin. In fact, I am an Apple shareholder, so bring on the margins! I have the iPhone X leather folio too. I thought that the quality of the work (sleeves for cards, auto shut off of phone when it is closed, the well-designed protective plastic clasp to hold the phone) justified the price — although, the credit card sleeves have expanded so much that the cards and the cash keep sliding out, so I am not all that thrilled with the quality of the workmanship eight months later. This is just a silly sleeve, for heavens’ sake: two pieces of cut leather sewn together. Big deal. No one’s “bitching about it”. Don’t like the price, don’t buy it. We're not allowed comment on the price? Crazy talk. Didn’t say you couldn’t, just that it makes you look petty, especially if you have no plans to do anything about it. Useless, overpriced, impractical descibes Apple cases. Incase makes great neoprene cases that will actually protect your $3,000 investment.